The Purple Emperor sedum (Sedum ‘Purple Emperor’) is a tough but beautiful perennial plant that produces stunning deep purple leaves and bunches of tiny light pink flowers. It’s a great choice for cut flowers and garden borders alike. Keep reading to learn more about how to grow Purple Emperor stonecrop plants. 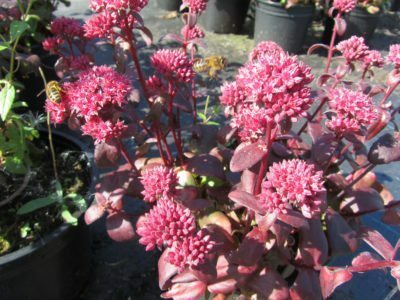 Sedum ‘Purple Emperor’ is a hybrid stonecrop plant bred for the striking color of its foliage and flowers. 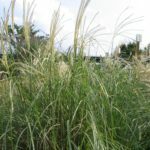 It grows upright with a height of 12 to 15 inches (30-38 cm.) and spreads slightly, with a width of 12 to 24 inches (30-61 cm.). The leaves are slightly fleshy and deep purple in color, sometimes appearing almost black. In midsummer, the plant puts out clusters of tiny light pink flowers on top of single stems. As the flowers open and flatten, they form flower heads measuring 5 to 6 inches (12-15 cm.) across. They are very attractive to pollinators, like butterflies and bees. Flowers fade in autumn, but the foliage will remain and provide winter interest. Old foliage should be pruned away in the spring to make way for new growth. Growing Purple Emperor sedum plants is very easy. Sedums, also known as stonecrops, are famously tough plants, earning their name from their habit of growing in the poor soil in between rocks and stones. Purple Emperor plants do best in poor, but well-draining, sandy to rocky soil. If they grow in soil that is too fertile, they will put out too much growth and become weak and floppy. They like full sun and moderate water. In their first year of growth, they should be watered more to encourage the growth of a strong root system. These plants look good in garden borders, but they also perform well grown in containers. Sedum ‘Purple Emperor’ plants are hardy perennials in USDA zones 3-9.